Here’s a great way to be rewarded for joining the NRA, or renewing your existing NRA membership. 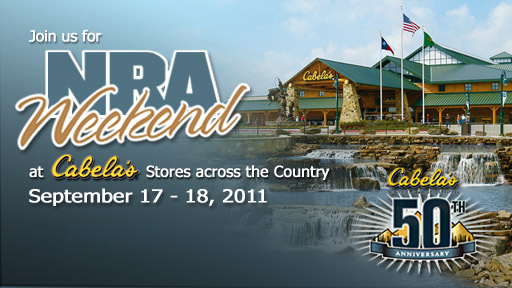 If you go to a Cabela’s store during Cabela’s 50th Anniversary event this weekend, September 17 & 18, 2011, you can get your annual NRA membership for just $25.00 — that’s $10.00 off the regular fee. But it gets even better. Cabela’s has sweetened the pot by giving a $25.00 gift card to everyone who joins or renews their NRA membership this weekend. This Cabela’s gift card can be used to purchase in-store merchandise, and other items sold online through Cabelas.com. You can’t go wrong with this promotion. Spend $25 on an NRA membership, and get every penny back in Cabela’s merchandise credit. Nice. Already an NRA Life Member? You can take part in the celebration as well. The first 50 NRA Life Members to walk through the doors of each Cabela’s store will receive a free Cabela’s 50th Anniversary pistol case with the NRA logo on the handle. Share the post "Cabela’s Gives $25.00 Gift Card to New/Renewing NRA Members"
The gyro-stabilized two-wheeled Segway was supposed to revolutionize personal transportation. That may never happen (mall cops excepted), but remote-controlled Segways just might revolutionize the way military and police personnel train for urban engagements. An Australian company, Marathon Robotics, has created wheeled robot targets — remote-controlled Segways fitted with target silhouettes. The Segway Robots can move and respond like humans, ducking into doorways, or dispersing at the sound of gunfire. This provides challenging, ultra-realistic training for military and police sharp-shooters. This is not just science fiction. 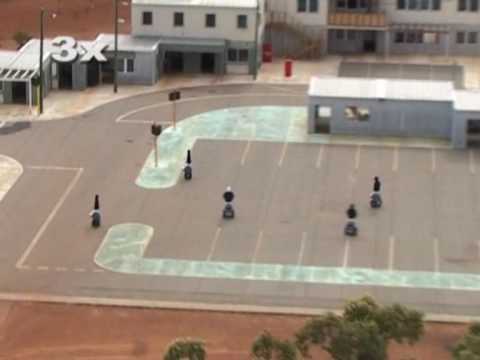 Australian Special Forces units already train in a mock urban center populated with Marathon’s rolling robots. And the U.S. Marine Corps has hired Marathon to create a similar robot-equipped, live-fire training venue. Marathon combined computer gaming technology with armored, remote-controlled Segways to create the ultimate 21st century moving target. The lower halves of the Segways are armor-plated, so the expensive electronic innards don’t get damaged by an errant shot. On top is mounted a replica human torso. The torso section can be clothed to distinguish “civilians” from military targets, or to distinguish terrorists from hostages. Marathon’s sophisticated software can control multiple Segway Robots at the same time. A group of Segways can be programmed to mimic a squad on patrol, or a group of terrorists holding hostages. The control software allows autonomous or “intelligent” behavior by the Segway Robots. For example, the Segways can disperse automatically at the sound of a gunshot, and the Segways can be trained to seek cover in hallways or behind objects. Importantly, the Segway Robots are capable of human-like movement — they can stop quickly, turn 360° and retreat slowly, or accelerate to a human running pace. Marathon’s Segway Robots are equipped with laser range finders so they can avoid running into obstacles, including people on the move. The “Segbots” lean forward slightly as they walk forward, like people do. Share the post "Wheeled Robotic “Smart Targets” for Live-Fire Training"
Bushnell recently released its new Fusion 1600 ARC range-finding binoculars. With a “low street price” under $799.00, Bushnell’s 1600 ARC binoculars are less than one third the price of Leica Geovids (10×42, $2399.00) or Zeiss Victory RF Binoculars (10×45, $2,799.00). That huge price advantage makes the Fusion very tempting — but can Bushnell’s 1600 ARC binos perform as advertised? 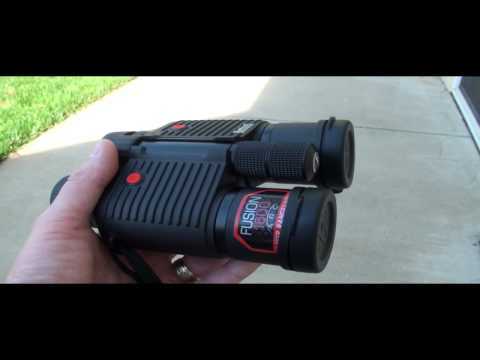 Forum Member Stan (aka BigBamBoom) acquired the Fusion 1600 ARC RF binoculars and has posted a video review. Stan was favorably impressed with the quality of the glass and the exterior ruggedness of the unit. He was able to range very large objects (water-tower, trees) beyond 1200 yards. He also praised the speed of the unit, saying it ranged faster than his Leica CRF 1200. Consider however, that the very small CRF1200 is harder to aim precisely, simply because it is so small and light and held in a vertical orientation. Most people can aim the larger, heavier LRFs with more steadiness using a normal two-handed horizontal grip. In the real world, if you can hold the LRF more steady, you can get a true range on a small object more quickly. It can be fun to range buildings at a mile, but for the hunter, that may not have much practical utility. You want to be able to range deer-sized game at all practical distances. For the tactical shooter, you need a narrowly focused beam (with minimal beam divergence) that can range a gong or metallic silhouette reliably at 1000 yards. If an LRF can’t do that, it may not be all that useful, even if it the sales price is attractive. The 10×42 roof prism binoculars feature built-in battery life indicator, twist-up eye pieces, and multi-coated optics with RainGuard. The Fusion 1600 is fully waterproof and submersible, meeting IPX7 “waterproof” specification. As Stan observed, the Fusion 1600 has good glass, and the red readouts are easy to see. Bushnell employs Vivid Display Technology™ (with four display brightness settings) to enhance display readability in all lighting conditions. The built-in laser rangefinder features ARC (Angle Range Compensating) technology, which calculates the angle to the target (-90 to +90 degrees). ARC also and gives the hold-over range for the rifle shooter, and true horizontal distance for bow hunters. We like the fact that you can choose between Inches and MOA for holdover. There is a brush mode for measuring distances in heavy cover and a bullseye mode for ranging in open areas. The brush mode can filter out false returns from closer objects. This IS a useful feature that actually does work. The Fusion 1600 ARC laser rangefinder binoculars come with battery, neck-strap, and carrying case. MSRP is $899.00. It pays to shop around as we’ve seen advertised prices from $789.00 to $899.00. For more info, visit www.bushnell.com or call 800-423-3537 for consumer inquiries. Share the post "Bushnell Fusion 1600 ARC RangeFinder Binoculars"